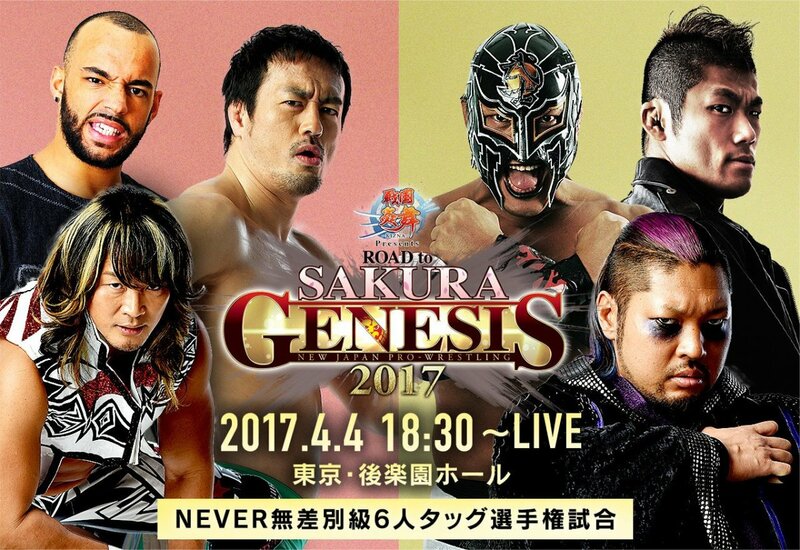 Here are this morning's results for the final Road to Sakura Genesis show before the PPV itself takes place on Sunday morning. This aired live from Korakuen Hall on New Japan World. - El Desperado, Takashi Iizuka & Taka Michinoku defeated Hirai Kawato, Jushin Thunder Liger & Manabu Nakanishi when Michinoku submitted Kawato with a crossface. Kawato jumped the heels at the bell. He scored a ton of near falls towards the end as he battled with Michinoku. - Yujiro Takahashi & Chase Owens defeated Tomoyuki Oka & Yuji Nagata when Owens pinned Oka with the package piledriver. This was a hot match with a lot of fast-paced action. - War Machine & David Finlay defeated Hiroyoshi Tenzan, Satoshi Kojima & Tiger Mask when Rowe pinned Tenzan after hitting Fallout. This was another solid match with a lot of heat. The finish was interesting as it gives War Machine the advantage heading into the IWGP tag title match at Sakura Genesis. - Toru Yano, Hirooki Goto, Jado & Gedo defeated Taichi, Minoru Suzuki, Yoshinobu Kanemaru & Zack Sabre Jr. when Yano pinned Taichi following a cane shot to the groin. Yano's usual antics led to the finish. It was fine, but not as interesting as the last few matches. Suzuki beat up some of the young lions with chairs after the match. - Kenny Omega & Bad Luck Fale defeated Tomohiro Ishii & Baretta when Fale pinned Baretta with the grenade. Baretta looked really good here. It was a good tag team bout overall with solid heat. - Tetsuya Naito & Hiromu Takahashi defeated KUSHIDA & Juice Robinson when Naito pinned Robinson following a low blow and the Destino. Early in the match there was a wild brawl where KUSHIDA did a running missile dropkick onto Takahashi that sent him through the guardrail. This set the tone of the match, as it was all action and by far one of the best matches of the night. - Kazuchika Okada & YOSHI-HASHI defeated Togi Makabe & Katsuyori Shibata when Okada pinned Makabe following the Rainmaker. They had a good, standard tag team match. Shibata and Okada had a staredown after the match. As Shibata started to leave, Okada sat down and did Shibata’s pose, mocking him. Shibata didn’t like this one bit, dashing to the ring and kicking Okada square in the back. He went for the penalty kick, but Okada countered with the tombstone. He cut a promo on Shibata before leaving. - Ryusuke Taguchi, Ricochet & Hiroshi Tanahashi defeated EVIL, SANADA & BUSHI to win the NEVER six-man tag titles when Ricochet pinned BUSHI after hitting a lifting DDT. This was a long, very good main event that built well and had some great action, especially towards the finish. Tanahashi had it won with the High Fly Flow, but the heels ganged up on him. BUSHI went to mist Ricochet but it hit SANADA instead. After an assist by Taguchi, Ricochet hit the benadryller but BUSHI kicked out. Ricochet finally won it with the lifting DDT.